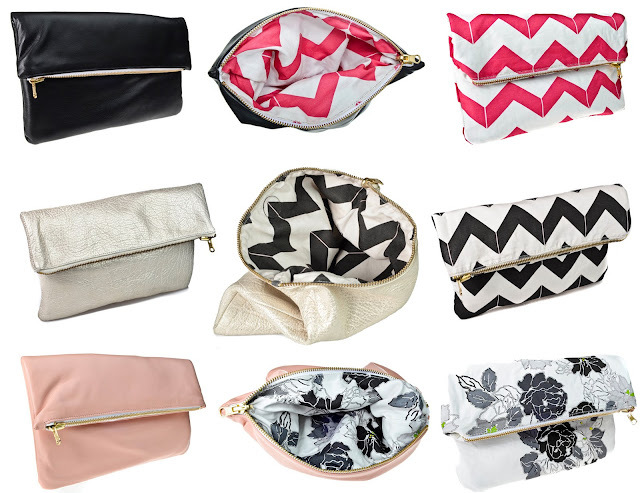 How amazingly cute are these reversible clutches?? I mentioned here that I am loving florals for spring, so I'm loving the pink clutch. But I think the gold one is my fave... Do you have a fave? I can't pick just one! Love them. How totally clever and beautiful! I love the pink one too, the floral is a lot of fun and love that blushy pink...beautiful! Love them! My favorite is the metallic one! Beautiful! I love the silver and chevron one. Really fun. I love the gold one, too! I'm loving the gold too!! So pretty! These are SO cute and fun! I especially love the silver/chevron one! I need one of these. Oh my. These are awesome!! I love the pink chevron - so fun! So fun! I love the gold one too! Yes! I love these--great find. All of their items are pretty. I love the DOPP kits too. I really like these! Cute and simple, and two looks for the price of one! ooh definitely the gold one too!